Even small and easy applications require design, monitoring and adjustment. 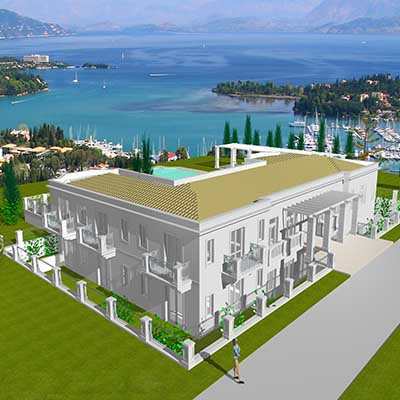 Design & supervision of MEP installation in a 5 stars resort in Skopelos island (18.000 sqm). 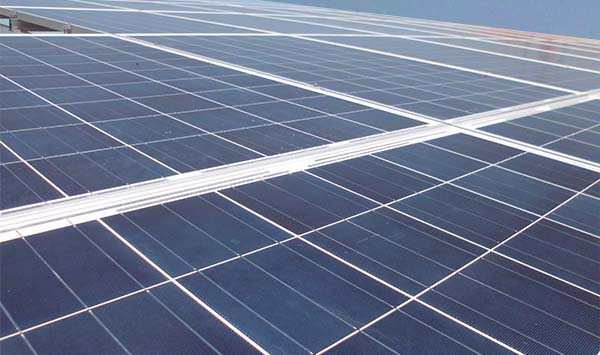 A special application of a domestic on-grid photovoltaic system in the area of Aliartos. 40 Schueco photovoltaic panels were installed and a Kaco inverter on a house terrace. The annual output of the system reached 14,000kWh and the annual financial income for the owner was € 3,350 / year! 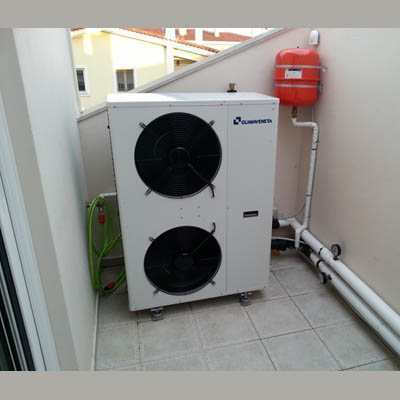 3 high-performance heat pumps installed to replace oil boiler for space heating and domestic hot water in a luxury housing complex of 1000sqm in Dionysos, Attica. 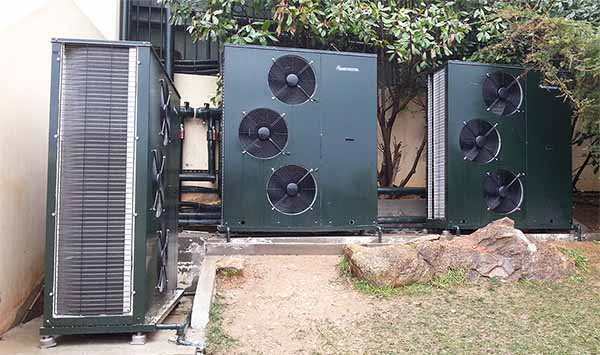 An array of 3 air-cooled, high-efficiency Climaveneta heat pumps with a total capacity of 75kW were installed to fully cover the needs of the housing complex in space heating and hot water. The existing boiler remained as a backup source. 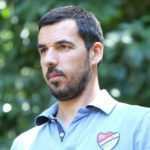 The owner achieved a 60% economy compared to oil, which translated to 12,000€ per year! Four Daikin Altherma Heat Pumps (2 x 16 kW + 2 x 8 kW), Rehau underfloor heating network and Carrier Fan Coils were installed to meet the 600 m² heating and cooling needs of the residential complex. The application has secured a 70% economy compared to oil, a benefit of € 2,500 / year! 62 m² of “Cosmosolar” solar collectors were installed with a total hot water storage bank of 3.500 lit. Expected economic saving 3.500 €/year, 80% annual CO2 emissions reduction. 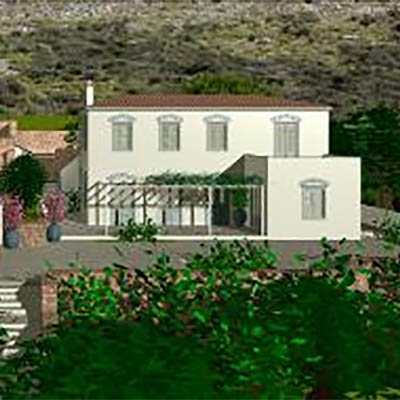 Luxurious 160m2 country villa with large surrounding area on a plot of 1200m2. Design of central air conditioning system with FCU and heat pump, energy study of housing, plumbing and wastewater treatment systems design, electrical installations design. Design and supervision of MEP installations in a luxury tourist accommodation in the Old Town of Chania, Crete. It is an application of special energy requirements, with rooms, restaurant and a preserved hammam! 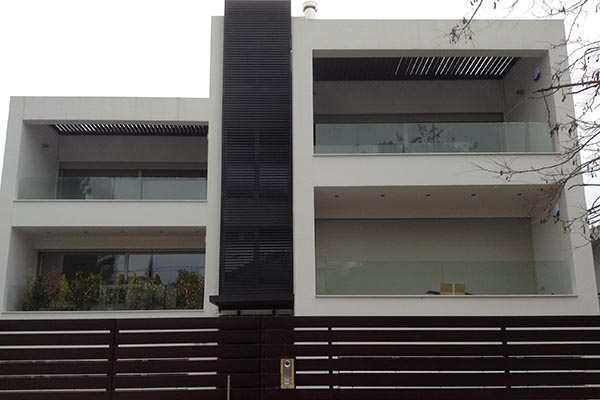 Luxurious 540m2 residence with swimming pool, gym, squash on a 5000m2 plot. Hydraulic and sewerage installations design, electrical installations, underfloor heating, central air conditioning and ventilation, swimming pool equipment design, solar thermal hot water system and pool water heating design. Conversion of a preserved, neoclassical, three-storey building with basement & attic to a department store and event venue with a total area of 3,500 m2. Design and supervision of hydraulic and sewerage networks, electrical installations, central air conditioning and ventilation systems. Photovoltaic systems factory SILCIO Α.Ε. &amp; PIRITIUM A.E. 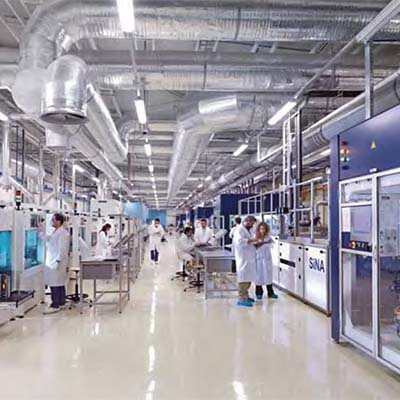 Industrial facilities manufacturing photovoltaic cells & polycrystalline wafers with a total area of 4,800 m2. Final design of central air conditioning and ventilation system, of a total capacity of 3,5MW, with special required air conditions in the production areas. 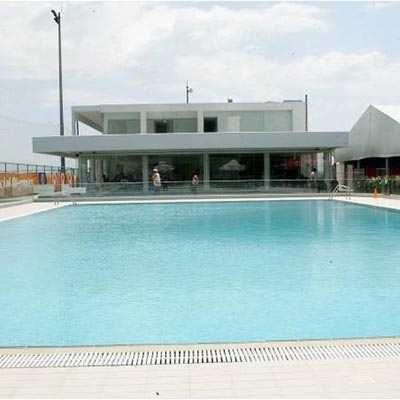 Main building of Panionios GC training center, total area of 1,400 m2, with dormitories, offices, restaurant-bar, changing rooms. Design of hydraulic and sewerage and central air-conditioning installation. 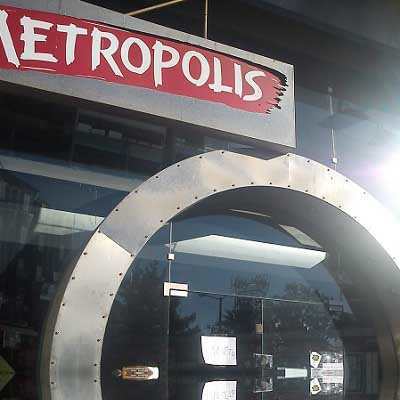 If you are planning to trust us with your project, perhaps you would like to know us better. Read more about us and see the complete list of all our projects. Installation of a heat pump in a residence in Geraka. A high-efficiency heat pump was installed in this modern residence to replace the the oil boiler. Now space heating is done by “pumping” heat from the environment and consuming a small amount of electricity. For every 1 kW of electricity used by the heat pump it delivers 4 kW of heat to the premises!! Installation of a heat pump in a residence in Ag.Anargyrous. The owners of the house needed a system that could provide them with quality heating, stable inside conditions and economy in operation. A high-efficiency heat pump was installed to supply hot water to the existing radiators. Now heating is efficient, with significantly reduced costs. 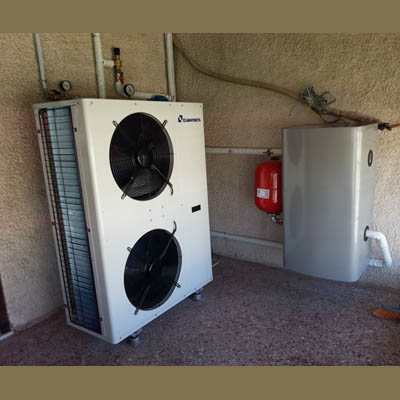 Installation of a heat pump in a modern residence in Geraka. 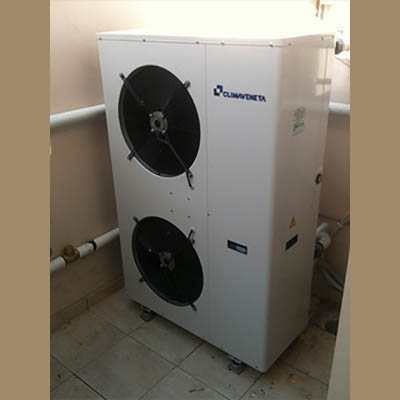 The apartment was dispatched from the central oil boiler heating system of the housing complex, using a high-efficiency heat pump. The owner managed to reduce heating costs by 60% and now enjoys low cost heating 24-hours per day.